This dish will be delicious sitting outside on the patio with maybe a nice dessert wine, where I live we have a great sale on berries this week. 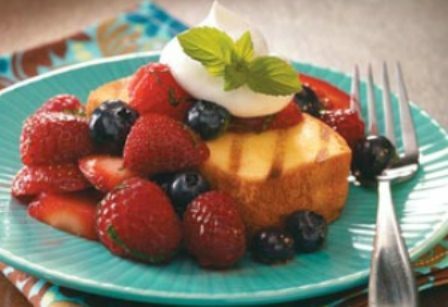 We have Strawberries, Blueberries, Raspberries and Blackberries all for $1.48 each; I thought these berries would go great with some grilled pound cake. You can use any kind or flavor of pound cake, if you want make some scratch or buy some at your local store or bakery. In our store we carry some delicious pound cake from 2 local bakeries, Buskin and Servatti’s and of course good ole Sara Lee in the freezer stection. Take your pound cake and slice it about 1 – 1 ¼ inch thick, place it on a medium hot grill, cook on each side just until you have char marks. Keep it whole or cube your slice, place in a bowl or on a plate, top with some fresh berries, a nice dollop up whipped cream. I also like to add a little chiffonade of fresh mint. Enjoy this any time of the summer, this a great dish to bring on a picnic as well…Enjoy! !